As much as we’d like to say we can, there are some things we cannot do. However, we will always work really hard to make our clients happy, and find a solution that is right for everyone. Responsibility for any services or functionality that is not hosted on our website. We do not support sites on other platforms. Integration or use of any software code, widgets, external scripts, client-supplied code snippets, forms code, or iframes. We make our best effort, but no promise that these can be done. In some cases, additional development and integration charges may apply. Migration of web content that requires a new Pronto-hosted page to have the exact formatting as the original page. We can migrate content, but exact page layout replication is not always possible, and additional design and development charges may apply. Private or secure website sections: sites requiring SSL (https). Additional custom banners (one is included with setup). Premium Stock Photos - we licensed images in volume and have thousands to choose from. 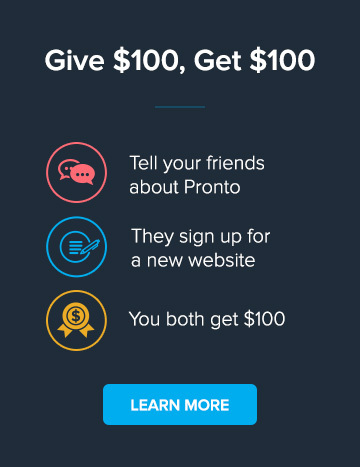 Custom graphics in other areas of the site beyond Pronto’s standard-page design standards. This would include licensing specific stock photos, creating complex images or page layouts, and custom forms. We will make our best effort, but no promise that these can be done. In some cases additional development and integration charges may apply. Emailing more than once a month will incur extra charges. Custom blog posts and articles will incur extra charges.